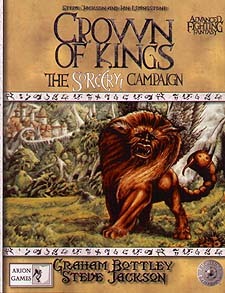 Crown of Kings; The Sorcery Campaign is an epic adventure for the Advanced Fighting Fantasy Roleplaying game. The Crown of Kings has been stolen from Analand by the evil Archmage of Mampang. The Heroes must cross wilderness and city, and face countless dangers, to recover the Crown and save the Old World from anarchy!